When Ampzilla Speaks, People Listen. In every generation, only a handful of audio products emerge that go on to achieve classic status. James Bongiorno's Ampzilla II power amplifier is undeniably a member of that club. A child of the 1970's, it received its most important audiophile review in the Absolute Sound Magazine, spring 1977, by John W. Cooledge. He found the Ampzilla to possess definition, but at the same time to humanize the sound "by means of a slightly lush high end, a quality which obviously must be counted as a coloration, but a merrily euphonic one." That, in my book, was one of the most insightful findings ever made by an audio reviewer. Many solid-state amplifiers, then and now, although sporting an impressive technical résumé, offer no more than a Zombie walk through a sterile musical landscape. That is, an experience lacking in emotional intensity. The Ampzilla II was always different. Its rhythmic, dynamic presentation was a hit with music lovers, while audiophiles quibbled over detail resolution and treble purity. Although I've owned a Son of Ampzilla 2000 for quite a while, the Ampzilla II came only my way during a monumental eBay binge during 2010. Cosmetically, it was in really nice condition as described by the seller, but of course, there were internal problems. I decided to have the amp rebuilt and connected with GAS Audio's Mike Bettinger. Mike's 30 years of design and repair experience brings a deep understanding and execution excellence to his rebuild projects. To quote from the GAS website: "Mike is your textbook nerd engineer. Sometimes completely normal; other times it's like talking to an absent minded professor stereotype with the social awareness of a fence post. He is most comfortable when digging into an amp or pre-amp and doing what he does best! He has an intuitive and experienced understanding of the equipment and. Whether performing basic repairs or complete restorations, there is a passion for the equipment and the music that he brings to everything he does." We agreed on a reference rebuild and soon thereafter my Ampzilla was shipped off to Mike. I asked him to describe the entire rebuild process from start to finish. The following is his story. The version you have is primarily an AmpzillaIIa with the 121G drive boards and the 123F output stage board. I say "primarily" because a few parts on the board were different than what I've seen, in this case a few resistors in the servo were out in left field. The top cover is the right one but the meters are the earlier Modultec models and the meter board is an earlier version as well. It matters not; it's just an observation. It also has the Sanken output transistors which I always thought where the best. In all other aspects it was a virtually pristine version of the amp that did not show signs of being worked on and is in cosmetically good shape relative to the majority of the ones I see. When put into my system, the stock amp sounded just like a 30-year-old Ampzilla sounds: it still has the "Ampzilla sound" and the dynamics that you noted - a fast, punchy quality to the low-end. The bottom end was not fully realized, sounding a bit anemic which shifted the balance upward in frequency, robbing the presentation of the proper bloom (if that fits in your audio dictionary!). 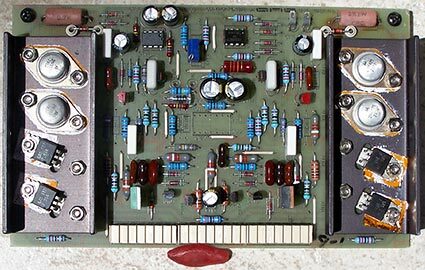 The midrange/high-end still hint at clarity without too much of the transistor glare that was prevalent in all of the reasonably priced competition during the early 1980's. But the prevailing attribute I noted with it in my office burn-in system was a filled-in, congested quality that, while not affecting the main body of the music, did not allow one to hear into the music, thus giving it a sort of flat presentation with no sense of body to vocals. Also the purity of the vocals and strings that I'm used to was on another bus. The background was presented with a textured quality. Playing any variation of well-recorded rock music at reasonable levels produced a roar, with the dynamics of the music stepping on any attempt at subtlety and nuance. If I didn't know the amp, I'd be questioning what all the fuss had been about! I'd call it a quaint artifact from a time when they didn't have the advantages of Gucci passive components and $2k power cords. 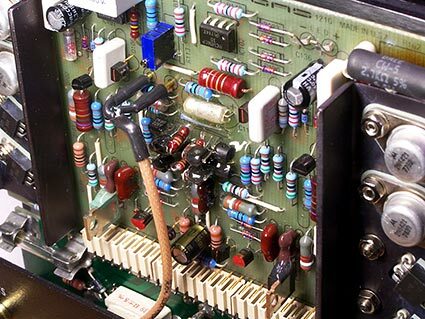 Fast-forward past the disassembling of the amp down to the bare chassis, stripped PCBs and the methodical reassembly to where we get to listen again. After a few days of burn-in to break in the new caps, the Ampzilla trademark sweetness is back. The amp has a "hear into it" quality, an airiness that allows supporting instruments and vocals to possess a body and a sense of attack on, for example, plucked strings, that gives them their own identity as part of a whole. One of the original Ampzilla traits, in comparison to the amps of its time, was its ability to get the balance of the male voice correct, where almost all other contenders, to my ears, added a chesty quality that sounded like they were slowing the voice down or bloating it once you became aware of it. 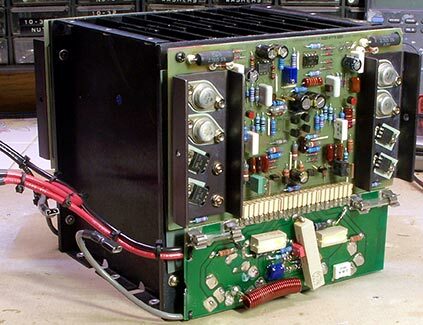 I think the overall impression of the rebuilt Ampzilla is that it's a very fast-responding amp without the bad connotations that may bring to mind; instead, the quickness provides the airy quality in the highs and mid, and allows the bottom end to resolve and solidly image low frequency impact and transients rather than serving up the a slightly blurred replica. Listening to the hall sounds on Neil Young's Massey Hall was quite spooky. The stage floor sound on Winter Consort's live album Icarus is a good example of airy low end. I like live recordings because there's a better chance that some of the integrity of the sound in the room might make it into the recording. My impressions tend to be based on the overall character and what I hear the electronics doing, not so much slicing away any part of the spectrum and isolating it, as I hear changes as affecting the whole picture. At this point we had a successful updating and very large improvement from the stock amp that, because of my attention to detail and the huge improvements in the sonic quality of today's parts, takes Mr. Bongiorno's original design and highlights the quality of the original engineering that created it -- what most Ampzilla owners would be very happy with after living with the 30-year-old stock amplifier. For the final fine tuning of the amp, I made a couple of changes to the input differential stage and converted it to a cascoded JFET design that I've done for several old customers over the past year. My personal amps have been running this design for maybe 5 years and I have three Ampzillas and two Sons of Ampzilla out in the world with glowing feedback and almost a year of runtime on the first one sporting this update. A quick jump to the conclusion finds that we are now very pleased and sonically confident in the amp we are returning to you. Technically, the addition is quite clean. I remove the original transistors from the board and install a cascoded pair in the original holes; I include a pair of 6.9v LM329 voltage references for the cascode in between the differential pairs, and bias the cascodes using the original constant current sources. I biased the JFETs where I like to run them and change the load resistor for this stage to return all of the operating points downstream to exactly where they were before the change. I modify a few resistor values in the servo to take advantage of the high input impedance of the JFETs and then listen. The good part is that the change does not affect anything downstream. The JFETs are like adding a high magnification microscope to the low level detail. The high input impedance improves the performance of both the servo and the feedback and sonically you get a fascinating purity on the vocals and can hear deep into the mix quality. It also allows the amp to sail through the pinch points in the music effortlessly while removing the haze that the bipolar transistor junctions impose on the fragile low level details in the music. The most notable characteristics are the purity and lack of edge that has always required a tube front-end to achieve. While, to be honest, the level that I can take this to is limited by the original board layout, the effect is still not subtle. This is what Lynn and I kept noticing was falling short in the first pass of the work; we have lived with our personal amps as well as the others I've applied this to and we are spoiled! As I mentioned, there was a struggle between being faithful and stepping out. The next observation is the improvement in the low level resolution that highlights the recording spaces and improves the integrity of the instruments, vocals and the space they were recorded in. Once the amp gets really warmed up, it genuinely shines in this area. The articulation and the sense of body to the instruments and performers are very natural. I will now leave it for you to evaluate in the context of your experience with the latest and best equipment you have the good fortune to be exposed to. Enjoy. He is essentially a new amp as you can gather from the pictures I've sent and, while I did put a lot of attention to detail into making sure your amp is an exemplary example of my work, every piece I work on looks and sounds like someone cared. I've been working on GAS equipment for a long time, so I know exactly where I'm going when I open one up and have the tools and parts I need to do the work efficiently and properly. I get comments about how complete my parts upgrades are (I must be losing money!) but we both know that even quality passive parts are not the expensive part of the work and, with the tools I have, I can strip and re-stuff a couple of Ampzilla drive boards in a few hours and have found that it's better to do it all rather than just selective parts replacement, which results in a lot of troubleshooting time when the amp comes back up and possibly a disappointed customer if it fails a month later. Experience tells me what active devices not to trust as well. A good thing is that GAS chose very reliable power transistors. Old, but not forgotten. 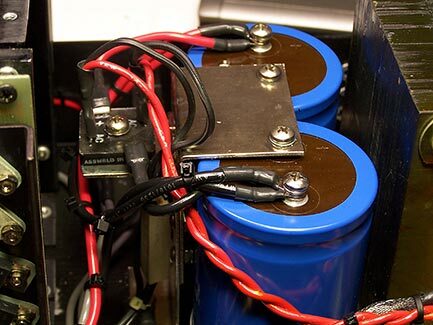 The rebuilt Ampzilla is very much relevant, even today in the under $10K price range. It shall find plenty of duty in upcoming speaker reviews.